10-36 VDC or 24 VAC (± 10%) 47-63 Hz Power is provided through a quick-disconnect terminal strip. For control panels where DIN-rail space is at a premium, the Skorpion series of plug-and-play (unmanaged) Ethernet switches with widths as little as one inch (26 mm) is the answer. Housed in a rugged metal enclosure with a metal DIN-rail clip, the Skorpion series includes models with 5, 8 and 16 ports. Some models provide one or two ports of either single-mode or multimode fiber optics with either SC or ST connectors. No configuration is necessary. All copper ports automatically configure their data rate and duplex using the auto-negotiation protocol. Depending on the capability of the link partner, communications is established at either 10 Mbps or 100 Mbps, and in the case of the GT models at 1000 Mbps, and at either half- or full-duplex. Each port will adapt to either a straight-through or crossover cable by using the Auto-MDIX protocol. fiber ports are fixed at 100 Mbps full-duplex for the highest performance. Multimode cable lengths cannot exceed 2 km and single-mode lengths cannot exceed 15 km without a special order. fiber optics is ideal for inter-building cabling in a campus environment. All Skorpion models have half-wave rectified low-voltage power supply allows for the sharing of power with other 24 VAC/VDC control devices. LED indicators of data rate and activity assist in troubleshooting. 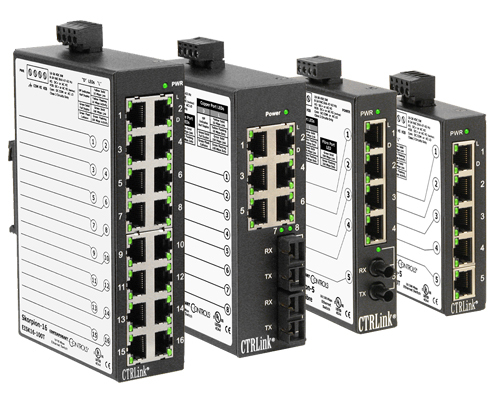 For control panels of nominal depth, the Skorpion series offers the widest range of Ethernet connectivity solutions. All Skorpion models meet regulatory approvals including UL 508 Listed, c-UL Listed, CSA 22.2 No. 14-M91, CE Mark and RoHS compliance.